Your elementary school classroom may have had an abstract puzzle with three dowels sticking out of a board and a pyramid of discs stacked on one of the dowles. The object of this puzzle was to get the discs from one side to the other without breaking a simple sequence rule -this puzzle is called the Towers of Hanoi. Dr. Eureka takes this beautifully simple idea and turns it into group game with many replayable scenarios and a fun theme. The Towers of Hanoi is fun little puzzle (albeit with low replayability and no interaction), but the similarities between Dr. Eureka and the Towers of Hanoi are only the surface. The game play, strategy, and level of fun are drastically different. 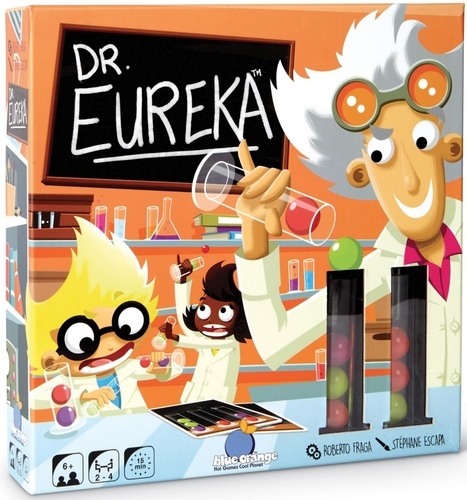 In this game, every player is a scientist, trying to help Dr. Eureka solve formulas. 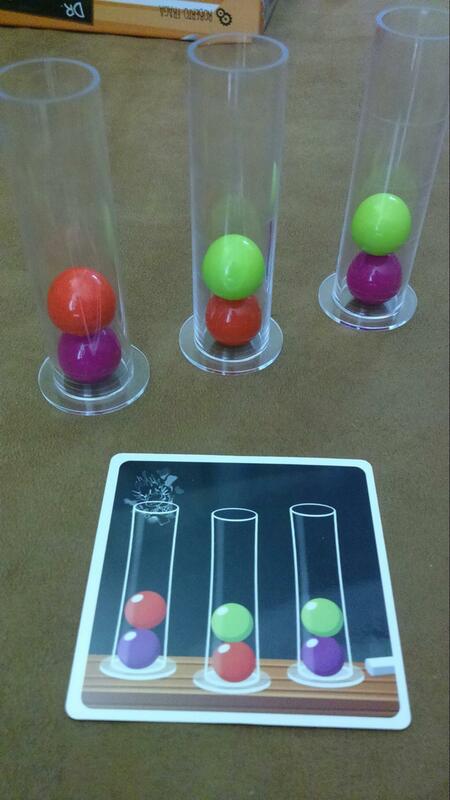 You solve formulas by using three test tubes to organize your colored balls into a desired pattern (as shown on a card). 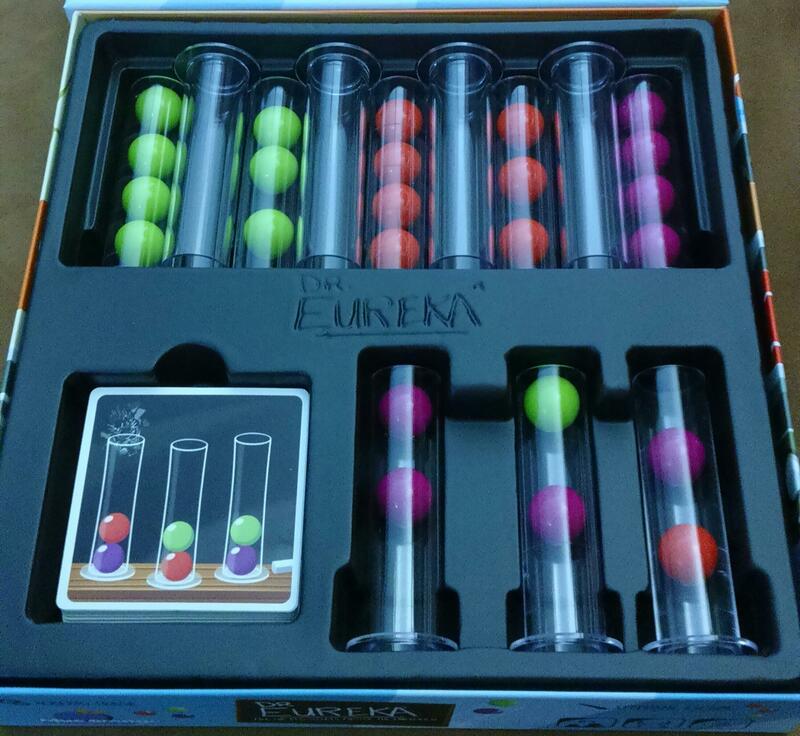 The trick is, you cannot just pour your balls out and put them back in the correct order, you must pour the balls back and forth into the other test tubes to get the correct order. To make the game a little easier, you can turn your tubes upside down to get the correct color order. This game stands out because: this game is both dexterous and thoughtful -not only do you need to figure out how to solve the puzzle, you need to execute it. Clearly this game is geared towards younger players, but it’s quite fun for adults too (and kids can often win). This game sneaks a educational lesson into a game. 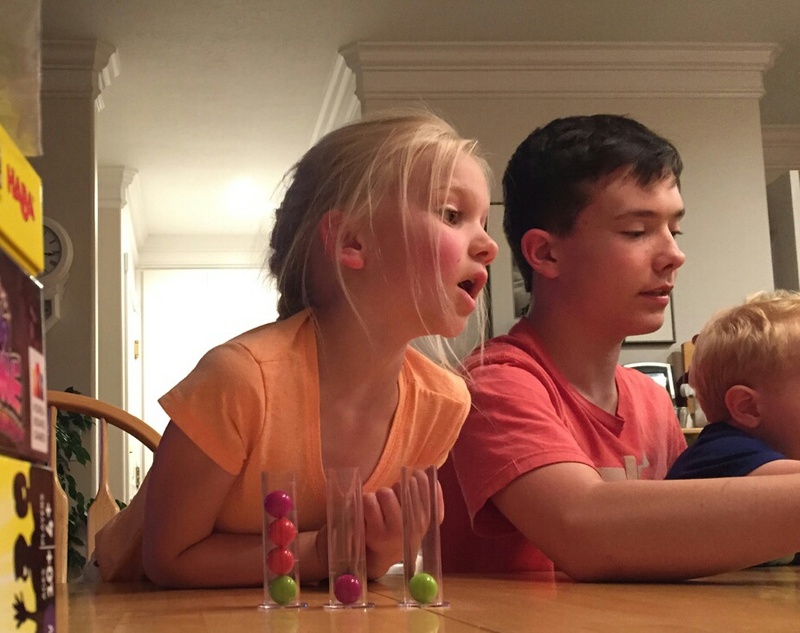 Kids will likely focus on the physical components and the racing, but they are teaching themselves logic, planning, sequence, and the always difficult task of thinking in reverse order. Everyone can play (and have fun). The game only comes with four sets, but if you want to add more players, just buy another set. Some kids will have a clear advantage at this game because their minds are formatted this way, but other kids can still get satisfaction out of just figuring out the puzzle without a race element (a round of high-fives once everyone figures it out keeps everyone involved and rewarded). Also, the solo play variation can be fun and challenging. Easy to set up and teach. Setting up this game only takes opening the box and handing out every player’s components (and if they have already played, they can set up the player tubes by themselves). Teaching the game is best done by showing and telling -and for this game it’s simple to do both at the same time. Teaching time depends on the age of the players, but typically everyone can be ready to play in under 5 mins. 4.Parents love this game. There are two reasons parents love this game. One, it’s easy to see the educational quality of the game. Two, it’s very rewarding to witness your kid figure out a puzzle (sometimes in a way you didn’t see). Perhaps most important, this game is fun. Deconstructing the game play aside, this game is just fun. Disregard the component quality, teaching time, and educational aspects, this game is just a hoot. It’s hard not to get excited when everyone is getting close to finishing the puzzle. Because of the excitement, it’s common for a player to drop a ball (luckily it’s so quick and silly no one gets upset). Some players will not feel engaged in this kind of game. The game comes with multiple play scenarios, but sadly some kids just can’t be tricked into learning -or having fun. Components are great but I imagine the tubes could break easily (however I’ve had great experience with Blue Orange Games replacing components for other games, so perhaps this should be a positive). Adults can have fun playing this game, but it’s more of a filler (but for the price it’s definitely worth it). This game is easy to teach because you can explain and show at the same time. With adults, you can hand out the components before explaining, but kids will get too distracted. Be sure to explain that you can turn your tubes upside down to achieve the correct order. For kids younger than 8, you can even the playfield by allowing them to use their hands to stop the balls rolling (but not rearranging). I like the fact that each round ends immediately and players keep the contents of the three tubes in whatever state they were in at the end of that round. This prevents the game from falling into the puzzle-game problem of the player being 5% better at solving wins 95% of the puzzles. With an asymmetrical start, there are times when a player will – through luck alone – be closer to the solution than others. This allows more players to at least gain a round victory, and I think this lends to a better overall engagement and enjoyment from the game. This one definitely works well as an educational game, and it’s also easy to teach. Look at this picture from the back of the box. I’ve just explained about 90% of the rules to you! Jonathan: This is a fine time killer, but not much more. 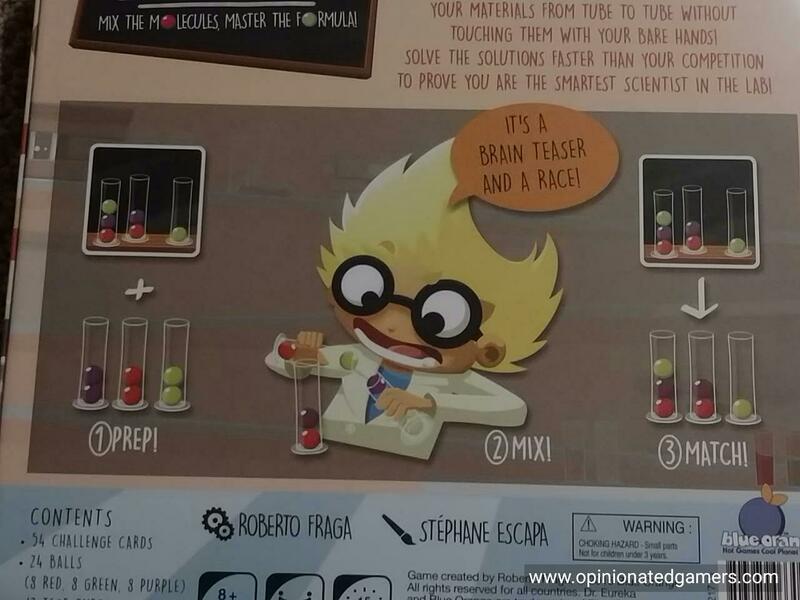 At the same time, I love the idea that you can put the beakers down upside-down, but thereby commit to that. I sort of wonder if for adults it would be more fun to say that at least one beaker has to be upside-down to win the card, but ultimately, it is what it is. Andrea “Liga” Ligabue: I liked the game, both in his “dexterity” version that in the “thinking” version. I was able also to try it in his “giant” version in Play – The Games Festival, thanks to the presence of Roberto himself. I like how the game works and the nice mix between dexterity and “puzzle-solving”. I think it could be also a very good game to use in boardgame’s classes at primary and secondary schools, to work with logic. Pingback: ★★★★½ Dr. Eureka: help a scientist discover chemical compounds -but what is he doing with these discoveries? | All Aboard Game: Reviews and Recommendations for Family Friendly Games.